What better place to set a movie about a con man's biggest stunt than in racing, where you know that everyone's trying to bend every rule possible to eke out an advantage, anyway? That's what they're doing with the new Will Smith movie Focus, and it looks like it works. Best of all, actual IndyCars will appear in the film. With several notable exceptions, fictional racing in movies tends to shoot pretty far off the mark, with scenes like the race scene in Iron Man 2 where the cars looked more like IndyCars and the firesuits were bizarrely muscular. Sometimes they go full steam ahead into fantasyland, like the hypersexualized F1 dreamworld of David Guetta's "Dangerous" music video (which had the full blessing of the Lotus F1 team, hilariously enough). C'mon, Guetta. Everyone knows this kind of thing is more NASCAR's speed. So, to avoid the Guetta Trap of unbelievable racing footage, the new film Focus enlisted IndyCar to help add some authenticity not only to its plot, but to its racing scenes as well. 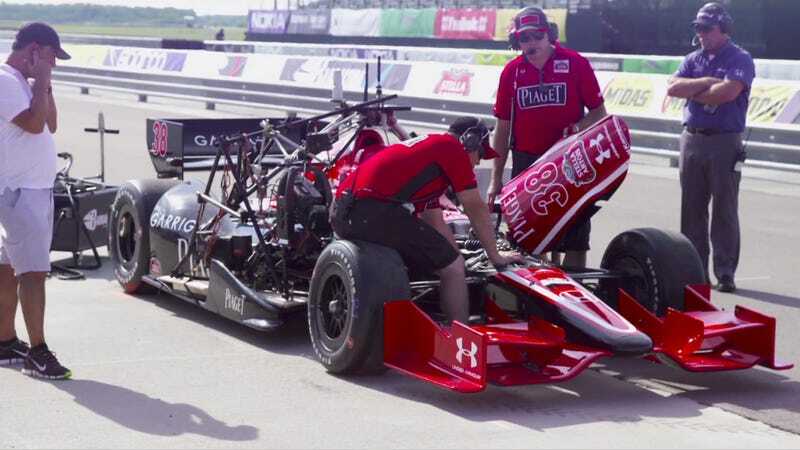 IndyCar released a behind-the-scenes short for the movie that shows IndyCars rigged up with all kinds of camera equipment, and it looks fantastic. According to Autoweek, many of the scenes were filmed at NOLA Motorsports Park, one of the circuits on this year's IndyCar schedule. Drivers Bryan Herta and Carlos Munoz helped shoot the racing scenes. "Obviously, movie driving is a little different than racing, but it was still good to get out there and feel the downforce, the power and all those sensations again," Herta told Autoweek. "I think the contract said we couldn't go over 100 mph. I'm not going to say we didn't, though." Driver and team owner Ed Carpenter is excited about getting IndyCar in front of new audiences. "Whether you want to talk about IndyCar racing or motor racing in general, it's a pretty segmented demographic," Carpenter explained to Autoweek. "It's nice to cross over into pop culture a little more and open up the sport to a new audience." This is the kind of thing I was hoping to hear more of on Media Day. This whole business of getting IndyCar in front of new eyeballs. This, this, this. I'll take it whenever it comes up, though. Better late than never.